Lisa Spiller at Bernard Gallay Yacht Brokerage has listed the new 28.64m sailing yacht Windfall for charter in the Western Mediterranean this summer. Delivered by Southern Wind earlier in 2013, she's a high-performance yacht also available for regatta charters by negotiation. Accommodation is for seven guests in three cabins. 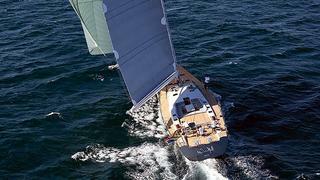 Weekly charter rates on Windfall are €45,000 in high season and €40,000 in low season.